Hauskaa lauantaita, tänään olen korttieni kera taas Auttoisten kylällä Suvimarjan edessä. Tervetuloa viikon Allsorts haasteen pariin! "Perhosia" toivottavasti näemme yhden ison tai monta pientä! Käytin alesta ostamaani Penny Blackin kaksiosaista stanssisettiä ja ja perhosleimasinta. Hi; Happy Saturday, it's time for a new Allsorts Challenge! Tracy Mouse's theme is " Add a Butterfly"! Maybe one big or lots of small ones. I made a big butterfly birthday card. A beautifully inky butterfly Mervi. Have a good weekend and hope the sale goes well. Mervi, I really like the colours you've used; the soft greens and grey go so well together. Thanks for joining us at Just Add Ink this week! A beautiful butterfly... love it!!!! Thanks for sharing it with us over at Brown sugar challenge! 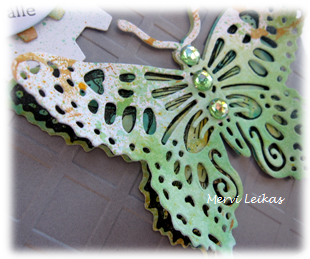 Love the pretty colours and patterns you got on your butterfly using the mists Mervi. Thanks for joining us at Just Add Ink this week. Beautiful butterfly! Thanks for joining Brown Sugar Challenge! Beautiful card, Mervi. Love the embossed background and terrific die-cuts. Beautiful creation, love the butterfly and a beautiful layout too.